How am I supposed to even hold it? If LG's decision to put buttons on the back of the LG G2 was already a little baffling to you, then Samsung's three-sided phone may just blow your mind. A new patent spotted by Gizmodo reveals a design from the Korean company for a phone with a curved screen that also wraps around three sides of the device. The patent, originally filed in May, became public this month, and it details a "method of operating functions of a portable terminal having a bended display." Unlike other smartphones with curved screens such as the Samsung Galaxy Round and LG G Flex, the patented prototype has a convex shaped display. The screen essentially spills over the sides, giving users an interactive display on the right and left edges of the phone. According to the patent, the extra screen space will be used to display the charging meter, a place for bookmarks, and other information usually relegated to the edge of an app. What's more, the extra space will be touch sensitive, letting users assign multitouch quick actions and reimagining the slide-to-unlock gesture as a side-mounted experience. 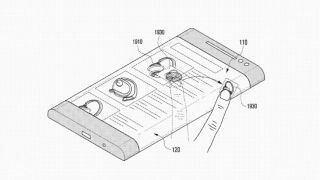 The patent also documents a few new interesting interactions that will let phone users drag items off the edge to a visual clipboard. In some ways a smartphone with an extended display seems like an ingenious idea. The curved display will give users more vertical screen real estate by moving the phone's status bar and placing menus off the normal edges. However, it creates a natural problem in that holding the phone could trigger any number of unwanted actions, though we're sure Samsung would develop some sort of fix for this. Today's patent find follows a Bloomberg report from last week that a forthcoming Samsung Galaxy phone may feature a curved, three-sided wraparound display. According to the publication's sources, the new phone may show its multiple faces in the second half of next year. With CES 2014 right around the corner, Samsung may decide the Vegas tech show is the perfect place to take this concept from patent to product. The tech industry could use a little crazy to freshen it up.